If you can fit it to your light you'll love the way it works. Not bad looking either. *Assuming cerakoting won't crack if bent, not that I'd use the clip much anyway. Cerakote is cool to look at, but if this light is going to be a user and you want the best look over time, I'd go with a different coating as it does seem to wear faster than HA. Ideally, carry bare Ti and then revel in its resistance to abrasion. Two other treatments that may (or may not) have appeal are stone washing & flame coloring. If you have a rock tumbler available the stone wash is something to experiment with - check with a local lapidary club if you need to use a tumbler. Flame coloring is another experimental treatment ... keep trying it & rubbing it off with a mild abrasive pad until you have the desired look. Bare Ti, even without the stone wash or heat color, might look really good against CeraKote. Ceramic is brittle by nature. Cerakote might be more flexible than solid ceramic, but I'm sure it will flake off eventually. Without hijacking this thread I'll have a look at stone washing and flame coloring. The light this will go on is safety orange with black highlights (bezel, O-rings and switch boot) so a black clip would look fantastic. That's whats making it hard for me to leave it not colored. I just wish the coater would hurry up - he's had the host for 3 weeks now and it's only an 18650 based light!!!! Find or have produced an AlTiN coated clip. I'll have a look at stone washing and flame coloring. I would like to get my LS20 polished and then coated with DLC/diamond. I would pass on the AlTiN. Sorry for hijacking. Last edited by Drywolf; 01-25-2012 at 11:15 PM. Seems like this AlTiN stuff is popular...might have to look into it more. Typical coating thickness is from 1 to 7 microns with 3 microns being common. 3 µm (which is 0.003mm or 0.000118”) is thinner than thin but works well for machine tooling. A thicker coating would be more durable on a light, with CeraKote running about 100X thicker than any thin film coating. Electroless Nickel plating (EN) is applied at roughly the same thickness as CeraKote but is extraordinarily durable. Industrial Hard Chrome (HC) shares a similar thickness with EN & is done at shops around the world, including one about 1.5 hours from where I live. Next time I go that direction I'll get a quote on a light. The AlTiN coated clip on my AlTiN coated Mule-PD is darker than the light. Still not the black of night, but if I was doing a Halloween colored light or something, I'd be happy using it for black. That can work as long as someone volunteers to have all the lights shipped to that person. Before shipment each light has to be stripped down to component parts so the LE, reflector, lens, O-rings, switch & boot, must all be removed. When all the lights are in one place they are shipped in as a group, coated & returned. The last coating service quoted 2 weeks & took 2 months. If someone wants to organize this I will forward all the contact info to them & they can handle it from there. Hopefully the results will be as expected. I noted that it's "Thorp" not "Thorpe" but assume it's the thing in question? That is the correct one, yes. It is the only driver I even try to use on my McGizmo clip screws. It also works well enough on other hex screws, even ones that the driver is slightly too big for. The edges of the bit are extremely hard and I haven't dented them yet. Thanks, fyrstormer! I just ordered my 1/16 MIP Thorp driver and two of the new style 1/4-20 clips, one for my LS20 and one for my Haiku. My SunDrop already has a new style clip on it, and I think it is an improvement in every way on the older style--which was, of course, the very best clip you could get before this newer style became available! LOL! Yes . . . I like McGizmo products. The MIP Thorp driver is really nice! This thing exudes quality! 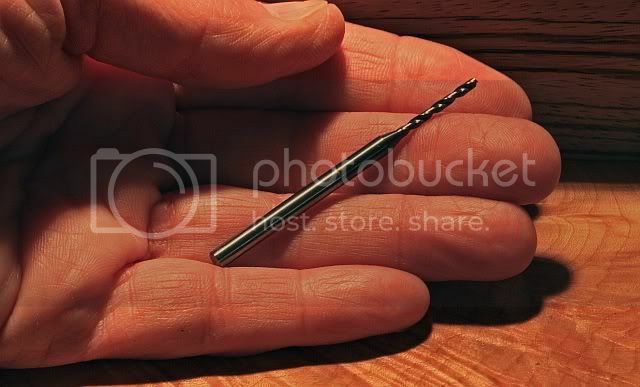 Just like the Titanium screws that Don uses to attach the clip. And just like the clip! Don, you've really hit perfection on these clips! Smooth, BB Ti perfection. Beautiful, wonderful, functional, ergonomic clips. One note: after I initially installed one of my new clips I felt like it wasn't straight. After some time examining it and thinking about what indicators one could use to determine "straightness" I came up with the following: snug down the Ti screws tight enough to hold the clip in place but loose enough to allow the end to be tweaked a bit. Then tweak the end of the clip (closest to head) so that where it touches the body is exactly centered on the underneath surface of the clip. You can do this also by feel, by inserting a fingernail underneath each side and making the gaps equal. Then do the final tightening of the screws and re-check. When I have done this, the clip has not moved during the final tightening stage. I had thought that the clips would "self-align" but from my (very limited) recent experience, it seems that there is at least a bit of play. When I first installed my new clip, I definitely felt that it was slightly off-kilter, but after aligning it in the above way, it looks perfectly straight. Don, what do you think? Suggestions? Comments? Any fine-points to offer on clip installation? I use the same method you came up with. You will notice that the screw holes are elongated to allow for variation in the bend I put in them as well as some axial variation in the screw holes on the pack itself (and different diameter such as the 2xAA pak). These elongated holes do allow for the clip to be off center unfortunately but it's a compromise I felt necessary. I don't think you could not have those holes elongated, Don. Don't you think that if you didn't have an allowance for a bit of play there that the result might well be an off-axis clip that could not be fixed? That would be my worry, certainly. As it is, it just takes a little bit of alignment before final tightening and you end up with a perfectly positioned clip. And they end up ROCK SOLID, too. I really LOVE the feel of these Titainium screws into the titanium body. Very nice feel and feedback as the screws are tightened to final torque. And the MIP Thorp driver just grips these bad boys with ZERO play and slip. And they take it. Despite a couple tries on both installations (one on Haiku and one on LS20) I could see no indications that there was any damage or deformation to the titanium scews. It all just . . . exudes . . . quality. Perfection, Don. Perfection. I love the McGizmo pocket clips! A couple of overseas companies are "borrowing" your clip design, but the quality is pretty bad. They look the same at first glance but are about half as thin and have little grip on a pocket. I'm curious if you designed that clip style Don, or someone of your team? It works, & looks good doing it! Why oh why is it so hard for anyone else to do properly? For international members: You can get these Thorp drivers relatively cheap on ebay. I bought mine with shipping to Germany for 16,65$. Here in Germany a high-quality German-made screwdriver can have a similar price. I can't take full credit for the design because the company who makes the blanks for me was already doing a similar solid blank Ti clip with width taper and the two perpendicular bends come from a forming tool they already had. I did a CAD drawing of the profile and cutouts and holes which they cut out for me and then bend at tip and hip. When I get the blanks from them I form the curved mounting bend using tooling and a press I cobbled together and then bead blast the clip to remove some of the tooling marks. They get full credit for using the gage and alloy of Ti in the first place which I think is the major key in the function and performance of the clip. 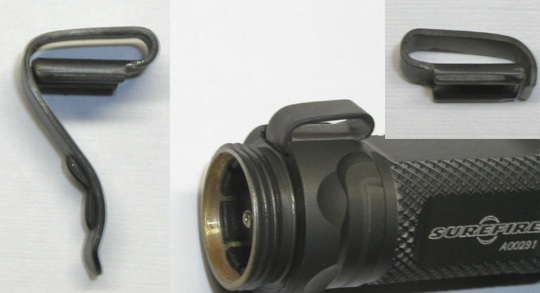 I think my design has enhanced the action and bend properties of the clip as relates to its rigid mount on the flashlight. Titanium's modulus of elasticity and the nature of its response to deflection in this application as well as other similar applications (probably the lock liner of knives if I have used the right terms) give it a significant advantage over other metals here, IMHO. Do you offer the damascus clips? or does someones else do those? I am new here sorry if this is not in the right place. Could you make a larger version for something sr90 size? 80-100mm? Btw the mip or Thorpe drivers can be sourced through Tower hobbies or any high end rc store. Hudy/X-ray drivers would also work well and they have billet/knurled handles. I have full sets of both from my rc days and personally I prefer the Hudy. I have these clips made for my flashlights. I am not focused on components for other flashlights or exotic materials for cosmetic purposes. So would that be a no on the larger size? Any other options? Maybe someone like jhanko, or precisionworks or photonfanatic could do something totally custom for you guys. I actually asked jhanko about some custom short-clips for the Jetbeam TC-R1/RRT-01, and the price quote he gave me was...prohibitive. Also he said he doesn't have time for new projects now.